ROSASCAPE* is a platform for contemporary creation. Established and directed by Alexandra Baudelot, Rosascape* is a platform for contemporary creation that straddles multiple spheres as a private art centre and production unit, exploring the contexts of production and reception of works as well as their mode of display by attending to specific notions such as the question of private, intimate space. 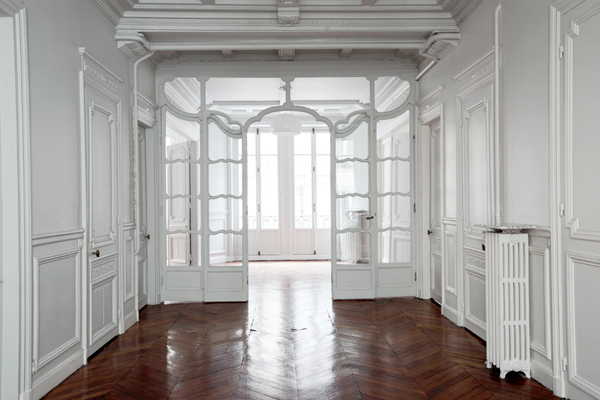 Rosascape opened its doors in September 2010, in an apartment in the 9th arrondissement in Paris. The decision to house Rosascape in an architecturally defined space — a private, intimate, theatrical space, playing with a tension between interior and exterior space and the domestic character of its surroundings — rather than in a neutral, 'white cube' type of exhibition space, stems from a will to perceptibly shift the relationship to artworks and artistic experiences. A critical awareness of the standardisation of exhibition spaces in the context of globalisation, and thus of the standardised relationship between the artwork and the public, led us to seek and occupy a site and experiential sphere of a different kind — a left-field space — and displace, in this way, our relationship to contemporary art. Rethinking display modes and methods in an attempt to provide a stimulating context suited to the specific nature of certain artistic projects and their critical dimension. How might the fragility of artworks, their personal resonance and their political and social import be preserved within a cultural context where the established rules tend to standardise the singular nature of artistic propositions? The exhibitions and works presented here are in large part produced by Rosascape. They are thus new pieces — works produced in situ which take into account the nature of the site and its surroundings as well as Rosascape's creative orientations. They are thus the fruit of the artistic project conducted by the artists in connection with the specific context provided by the space and Rosascape's specific modes of production and dissemination. A context we have tried to leave as non-standardised as possible, thus breaking with certain rules governing the art market and with certain display modes which often prove restrictive for artists. A series of talks, events, and performances are organised in connection with the exhibitions. Rather than a commentary on the works or a kind of 'satellite' programme, these events can be viewed as an extension of the exhibitions and projects developed by the artists at Rosascape. The discussions, performances and exchanges they give rise to are so many ways of approaching the artists' work and the issues they raise. These events offer an additional opportunity to experience the works and the artists' engagement with their work. All talks are then put online on the Rosascape website under the generic rubric "Who's Talking". Another website feature are the "Two Voices" talks, conducted by philosopher Théodora Domenech. Mobilising certain philosophical and aesthetic concepts, these dialogues between Théodora Domenech and the artists working at Rosascape offer a singular and sensitive approach to the artists' work and to the intimate workings of the creative process. As part of the exhibitions and projects running at Rosascape, we regularly organise workshops for children, facilitated by the artists. Right from the start, in 2009, Rosascape launched a publishing policy centred on artists' books. These projects provide an opportunity to reflect in a specific manner on the question of production, creation, and circulation in the contemporary art field. These books are works in their own right which use different techniques ranging from the most traditional craftsmanship to the most industrial forms. The book is explored as a space for creation which is sometimes a constitutive part of the exhibitions produced and presented at Rosascape. An artist's book is part of an artist's body of works and, through the myriad forms it can take and the singularity of the works it gives rise to, it represents a unique creative process. Rosascape endeavours to follow a strong network policy through which diverse audiences, collectors, businesses, patrons, artists, art theorists, etc., are invited to discuss, in a communal dynamic, questions tied to contemporary creation, thus making the relationship to art a dynamic space for exchange. * Borrowing from Gertrude Stein, ROSASCAPE inscribes itself as a territory: "a rose is a rose is a rose" — an assertion that language invokes reality, that the mere name of a thing triggers a movement of the mind which engages the imaginary, one's personal experience and critical appraisal.